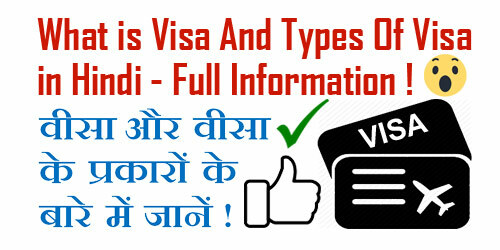 pixel What is Visa And Types Of Visa in Hindi - Full Information Related To Visa ! What is Visa And Types Of Visa in Hindi - Full Information Related To Visa ! What is Visa And Types Of Visa in Hindi - Full Information ! लेकिन उससे पहले दोस्तों यदि आप चाहें तो हमारे इस वाले पोस्ट को भी पढ़ सकते हैं - जानें ऑनलाइन पासपोर्ट के लिए आवेदन कैसे किया जाता है ! 2.) Complete Process Of New Bharat Gas Connection | एजेंसी से लेकर घर तक ! 3.) How To Apply For CSC (Common Service Center) Online Step By Step in Hindi ? 5.) Passport Application Documents Required in Hindi ? | Documents Required For Passport.